It’s the height of summer, and if you still want to upgrade your wardrobe, Reformation offers up the perfect solution. The buzzy brand unveils its Hawaiian Collection featuring colorful tropical prints. From two-piece sets to form-fitting minidresses and button-up shirts, Reformation offers chic finds for summer. See some of our favorites from the Hawaiian collection below, and shop the rest at TheReformation.com. Channel tropical vibes in a short sleeve top made with a button front closure. A mini length dress comes with a sweetheart neckline and zipper at the back. Is this the latest Chanel Mini Square Bag? It does look a lot like the Classic Mini Square. But then again, maybe it’s not. We will be comparing some features later in this post. So meet the Chanel Enamel CC Square Bag from the Pre-Fall 2018 Collection. It’s a new bag indeed with a refreshing futuristic logo to pair with your next season outfits. The material used is so fuzzy and warm, which makes you want to hold it forever when the cold winter starts. So what do you think? Is it a yes? The dark multicolor is the ideal shades for the upcoming seasons. It does feel like a softer version of the Tartan print. The bag is made from tweed mixed with calfskin – the body is crafted in tweed, but the woven chain leather strap is partly put together with calf leather. The design of the chain is similar to the classics and it’s long enough to carry on the shoulder or over the shoulder. The shades match perfectly to your winter jacket or sweater. The futuristic CC logo makes it attention grabbing and luxurious. But really, the enamel CC logo will match the color of the bag. Then the edges are refined in gold hardware for the shimmering-effect. It’s stunning but a new bag. The Chanel Enamel CC Square Bag is measured 7.1’ x 1.6’ x 7.9’ inches. The Chanel Mini Square Bag is sized at 5.3’ x 3.1’x 6.7’ inches. So it’s not the Square Mini Bag because the measurements are different. In fact, the Mini Square Bag is smaller than this new Enamel CC Square Bag. Is that a good thing? Which also leaves us to another question: is this the New Mini Square WOC the? 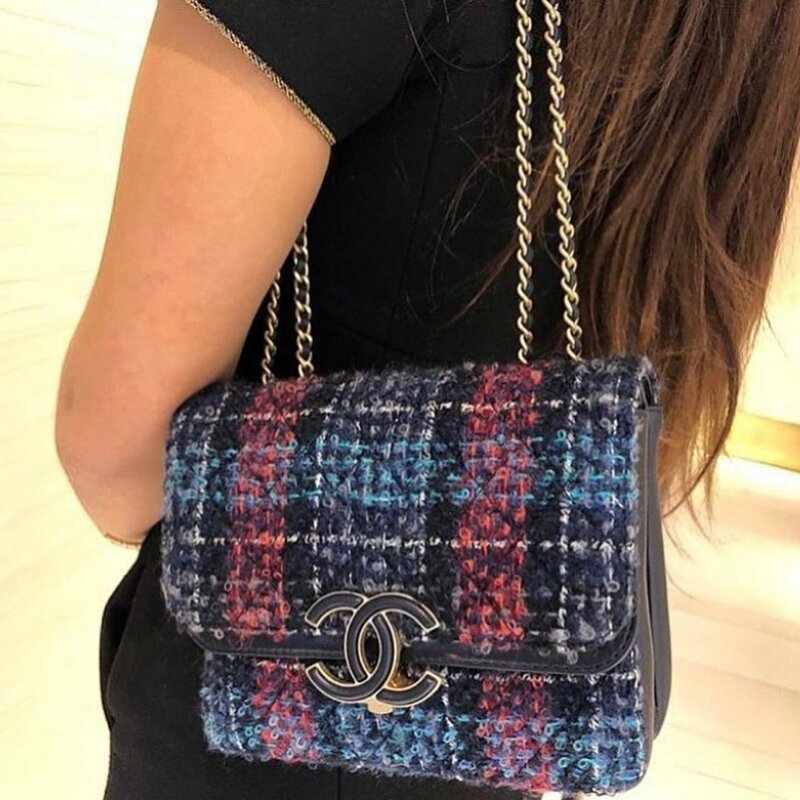 The Chanel Mini Square WOC is sized at 6.7’ x 2.4 x 5.7’ inches. And again, the sizes are different. So it’s not the mini Square WOC either. This Enamel CC Square Bag is an entirely new style. We don’t have the exact picture of the interior. But looking from the sides, there should be two compartments. And it’s a small-sized handbag; so don’t expect more essentials to store than your daily stuff. Summer vacation time is here, and Urban Outfitterswill help you make the most of it with the fashion retailer’s latest trend guide. Focusing on tropical styles, the lookbook focuses on vibrant prints and breezy silhouettes. From wide-leg pants to colorful sundresses and crop tops, warm weather style never looked better. Paired with slim sunglasses as well as cool flats, be inspired for your next getaway looks. The online shopping revolution has reached a point where many retail stores are struggling to stay afloat. And that includes many stores that cater to well-known fashion brands. As these stores try to figure out ways of staying relevant in the face of this onslaught, the deals for people who are buying their fashion items online seem to be getting better by the minute. You can easily get carried away with this online shopping, of course, since most of the items are bought by credit card and it can be ridiculously easy to click away until you’ve spent way too much money. That’s why it’s a good idea for you to devise a plan to prevent the nasty hangover of online shopping: the enormous credit card bill that somehow makes all those fancy clothes look less glamorous. Just as online shopping has boomed, so have the resources grown for those people who want to save as much money as possible and still get the items that you want for your wardrobe. There really isn’t any reason for you to spurn the best of these resources such as PlusVoucherCode. But you should also come up with some strategies to prevent you from getting buyer’s remorse from all the online shopping. A few smarts can go a long way in the world of online shopping for fashion, and here are some of the ways that you can display those smarts. There are times when a deal seems too good to be true. And, in many cases, it is. The best way to find this out is to take a quick perusal of the reviews. Always remember that the more reviews there are, the more reliable a consensus it will tend to be. Don’t just settle for the star rating either. Take the time to scroll through and read the reviews in as thorough a fashion as possible. That way you might find out something that either draws you to or steers you away from the item in question. Nobody likes seeing their inbox flooded with hundreds of e-mails. But the truth is that submitting your e-mail to a store upon purchasing an item not only will likely get you an immediate discount on that item, but it will also put you on a list to receive offers that the average customer won’t get. Deleting a few e-mails here and there seems a small price to pay for this convenience. The problem with online shopping is that it can almost seem like you are getting the items for free: Click a button on some mouse and great clothes appear at your door in a matter of days. But when the bill comes due, you might not be ready for it. Try to go into each month with a set amount that you will spend on these items, getting discounts where you can, and don’t exceed it. Not many people know that buying abroad, despite shipping costs, can be cheaper for some products. For example, if you are looking for Made in Italy products, ordering directly from Italy can save you money compared to buying imported goods with the increased prices from the retailer. By accessing amazon.it, they may send the goods directly to our address for products authorized for sale abroad. Furthermore, using these Amazon discount codes reserved for the Italian market, we could save even more on our purchase! These are some of the ways that you can shop smartly for your online fashion items. Following these tips will help you enjoy the benefits with none of the aftertastes. See the top stories from the past week of July. Devon Windsor travels to the high seas for the July 2018 issue of Vanity Fair Italy. Lensed by David Roemer, the American model goes for a boat ride in nautical inspired looks. Stylist Sarah Gore Reeves selects a mix of swimwear, striped sweaters and wide-brimmed hats. Devon poses in the designs of Gant, Max Mara, United Colors of Benetton and more. THE NEW $2 MILLION VICTORIA’S SECRET FANTASY BRA IS HERE!